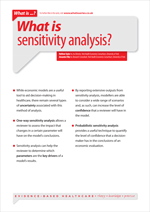 What is sensitivity analysis? | Whatis Series...? Probabilistic sensitivity analysis provides a useful technique to quantify the level of confidence that a decision-maker has in the conclusions of an economic evaluation.